IF YOUR ORGANISATION WOULD LIKE US TO ARRANGE AN EVENT WE WOULD BE HAPPY TO DISCUSS THIS WITH YOU. Jan de Vries world renowned naturopath, author and broadcaster very kindly agreed to give a lecture at the Craw's Nest Hotel in Anstruther on 'How to live a Healthy Life' through a holistic approach to well-being. He asked that the proceeds from the evening be donated to a local charity. ENFACT decided that the fantastic amount of �1000 go the The Wheelchair Charity which is run by Eleanor Bowman of the Craw's Nest, who also enabled this evening to happen. The event was organised by the UK herbal medicine firm Bioforce, Nature's Way, Fife and ENFACT. To celebrate the Natural Health Week, an Independent Health Store Event, E.N.F.A.C.T. joined with Natures's Way Health Store in a Natural Health Day. There were Talks and demonstrations by Natural Health Advisors. The public were able to sample the different therapies and herbal teas and organic foods were served all day. Local schools and Nursery school contributed Art Work to show how healthy we should be. A Natural Health Day was held in Waid Acadamy. Waid Acadamy Assembly hall made a good venue for this day as there were many therapies to sample. There was also the chance to listen to the experts talk on the Digestion and how to prepare for a Healthy Winter. Also a talk by a naturopathic nutritionist on how to control stress plus the benefits of giving children Omega 3 and 6 oils. There was information on how to appreciate our countryside and a fitness instructor to advise on how to exercise correctly. Medical advice and blood pressure checks were also available. On view was local school childrens' art and written work on how to keep healthy. Raffle proceeds were given to Anstruther Primary School to aid health promotion in school. The day was packed with many new experiences for the children who were given an insight into how other cultures manage their health and wellbeing. 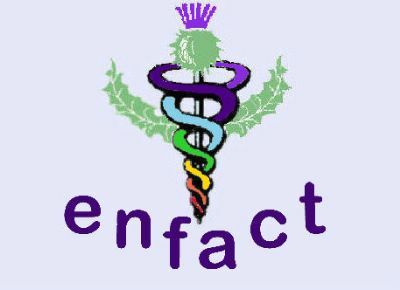 Complementary therapies from the Alexander Technique to Yoga were demonstrated by E.N.F.A.C.T. therapists. On this occasion there were workshops for the children on Aromatherapy, EFT, Massage, Reflexology, Shiatsu exercises and Yoga. to which the parents were invited to join in. Parents were able to sample Hopi Ear Candling, Indian Head Massage and Reiki. Information and advice was given by Attention Fife, a group which helps children with attention difficulties in a holistic way. There was advice on Food additives, Essential Fatty Acids etc. Also a Naturopathic Nutritionist was on hand to help with dietary problems. Pupils parents and staff were treated to a similar day as part of their Health Promotion Day. The children pictured below are showing the fruits which were featured in their health quiz. THE STAFF AT THE SCHOOLS WORKED VERY HARD TO MAKE THIS HAPPEN FOR THE CHILDREN AND PARENTS. COMMUNITY SPIRIT IS VERY IMPORTANT AND EDUCATING ABOUT OTHER CULTURES IN THIS DAY AND AGE. BOTH SCHOOLS HAVE GONE A LONG WAY TO ACHIEVING THIS. WE AS A GROUP ARE VERY PLEASED TO HAVE BEEN PART OF THIS.